United by a love of opera and deep family bonds, tenor brothers Pene and Amitai Pati, and their baritone cousin Moses Mackay have carved out a unique niche for themselves. While continuing to study, train and make huge achievements within the classical world, they have been able to take the music they love to a fresh audience. Helped along the way by their vivacious good humour, and a refreshing slant on contemporary tunes and the classics. Returning to the legendary Abbey Road Studios in London, On Another Note is a step on from their debut. In their own words they have 'turned the volume up', choosing a selection that really showcases their voices in the classical and popular styles. In keeping with the deft balancing act the boys manage between the two worlds, the album's release heralded by both an operatic classic, and a contemporary cover. Stella is an especially important song to Sol3 Mio, because it was sung by Pavarotti who has been a huge influence, and inspiration, to their music and careers. Though it's a claim he would never dream of making himself, Pene has said 'the greatest honour I've ever had was to be called the next Pavarotti'. Highlighting the heritage going back to the maestro's final album Ti Adore, and giving the song their own unique Sol3 Mio treatment, Stella is a glorious opener and scene setter for what is to follow. 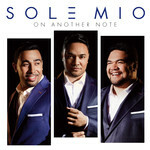 Conversely their impassioned, powerful performance and arrangement of Ed Sheeran's I See Fire, is another example of how Sol3 Mio are able to seamlessly bring the skills and nuance of the classical singing world, into the popular arena. This contemporaneous gem, originally written and recorded for Peter Jackson's The Hobbit: The Desolation Of Smaug is transformed into the boys rousing anthem to New Zealand. With its stunning video shot on Auckland's iconic West Coast, I See Fire is sent out like a musical beacon to resonate with all New Zealanders, home and abroad. 8. Che Gelida Manina (From "La Boheme"